The only remaining Verney Pipe Organ still in its original location. Preliminary documentation and stabilization in 2009 allowed for this organ to be awarded Historic Organ Citation #385 from the Organ Historical Society. Some sources date this instrument to 1905, others later. The church was extensively damaged by a tornado and fire that swept through Terre Haute on March 23, 1913 (Easter Sunday.) The sanctuary was rebuilt on the original (1870’s) foundation. Historical photos suggest that the chancel was elevated slightly when the church was rebuilt. Examination of these photos also seems to indicate that the Verney organ was in place before 1913, and was slightly modified when the sanctuary was rebuilt, using parts of the original case sides to widen the front of the instrument, but with no interior changes. The organ is unplayable at present, but is eminently restorable. As the only Verney organ still installed in its original location it should be preserved and cherished. Liebl. Gedackt Bass 8 Ft.
Liebl. Gedackt Treble 8 Ft.
Open Diapason Treble 8 Ft. The basement still contains a Champion Bellows Forge Co. blower, connected by a belt to a more modern GE electric motor. The wind line from this to the organ has been removed and discarded, and the path this originally took has been sealed. 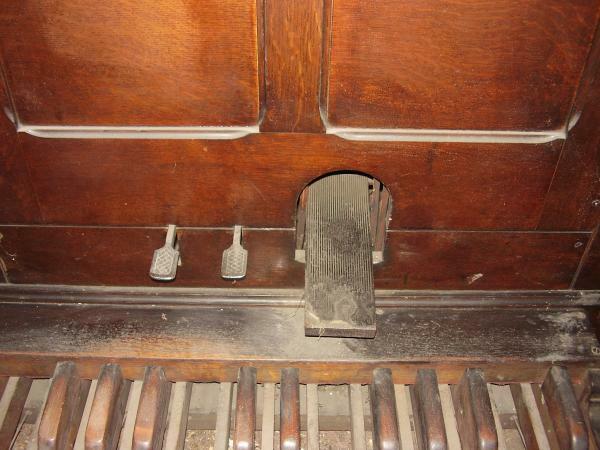 The original reservoir was removed at some point in the past, although the pumping handle and its floor bracket are stored within the organ. A smaller single-rise reservoir is stored within the organ, but there is no conclusive evidence that this was ever actually connected. If it was, the Pedal Bourdon would have always been on, as the ventil for this stop appears to have been integral to the original reservoir. The following article (reprinted with permission) discusses the local enthusiasm when Buzard connected a temporary blower for a special event at which the OHS plaque was presented and the organ was able to be heard for the first time in many years. TERRE HAUTE— Sunlight shone through stained glass windows, onto brightly waxed hardwood floors, as a 104-year-old pipe organ played “Amazing Grace” for the first time in three decades. About 160 people packed into the Allen Chapel AME Church at Third and Crawford streets Sunday afternoon, as the Organ Historical Society presented a citation in honor of the only known Verney Pipe Organ remaining in its original home. Keith Williams, Service Director for Champaign-based John-Paul Buzard Pipe Organ Builders, recounted the amount of dirt and dust inside the organ when he first began work on restoring it this summer. The organ has been silent more than 30 years due to disrepair, he and others in attendance said. “I’ve been an organist since I was knee-high to a grasshopper,” he said, adding that he’s been an organ builder about 30 years. Not much is known about Mike Verney, Williams said in between playing sets upon the namesake instrument. Verney learned the craft of organ building in Pekin, Ill., before launching his own enterprise, the Verney Pipe Organ Co., established in 1900 and incorporated in 1904. By 1910, his company seems to have disappeared, and the master builder apparently went back to work for other people, Williams said. But his organs remained and, it would seem, were quite well-built, Williams said, noting that the one in Allen Chapel was most likely built in 1905.Only two other Verney organs remain in existence, he said. One is in storage in Wisconsin and the other has been moved three times. 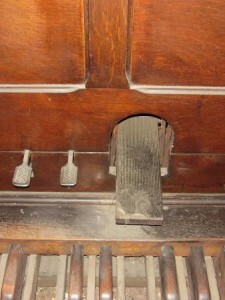 Allen Chapel’s is the only known organ still in its original home. Joy Sacopulos, president of the Friends of Historic Allen Chapel, said the history of the organ alone would qualify the building as a landmark. The church was listed on the National Register of Historic Places in 1975 for, among numerous reasons, its usage as a station on the Underground Railroad before and during the Civil War. It was also the first black church in Terre Haute and doubled as a school in the days of segregation. The bell from Vigo County’s first courthouse hangs in its tower, she added. “And if we didn’t have any of those reasons, the organ itself would be a reason,” she remarked on the historical significance of the church, calling Williams a “hero” for returning it to working order. The organ contains three ranks and 198 pipes, and those in attendance sang along as it played familiar hymns and songs as it had in the previous century. The Historic Allen Chapel restoration plan is now in its sixth of seven phases, as the installation of a chairlift and shaft is under way. The final phase will include more interior repair and restoration.